And then I’ll take my pilgrimage. 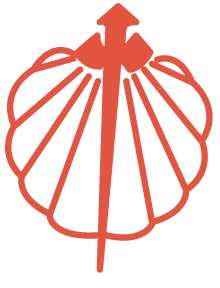 The scallop shell is a well-known symbol of The Way. The symbolism behind this depends on who you ask but we’ve read that it dates back to medieval times. This shell is commonly found along the Spanish coast and it is said that the lines in the shell represent the many ways in which you can reach the final destination. Today many pilgrims wear the shells on their packs. It is also used to mark the trails of the camino and most alburges hang a shell outside their door, making it easy for pilgrims to identify places to stay. Pilgrims who died on the path where once buried with their shell.